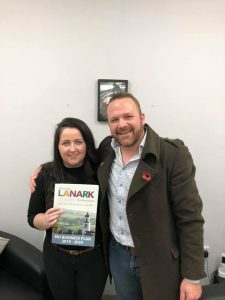 Lanark and Hamilton East MP Angela Crawley has given her support to Discover Lanark’s campaign to establish a Business Improvement District (BID) in the town. A BID is an initiative where businesses work in partnership with Local Authorities to regenerate their town centres. Discover Lanark have produced a 5-year costed business plan setting out the projects and services put forward by the town’s businesses and organisations that the BID will implement. There will be a vote of all Lanark businesses in February next year to decide whether to adopt a BID scheme or not. “Town centres across the country are struggling to remain relevant. “This is down to a number of factors, including the shift in consumerism and the rise of out of town shopping centres. “As a result, empty town centre units are on the rise. “And as these challenges become more apparent, it is vital that we have a strategy to meet them head-on. “Discover Lanark have a plan backed by aspiration, ambition and with a solid foundation.